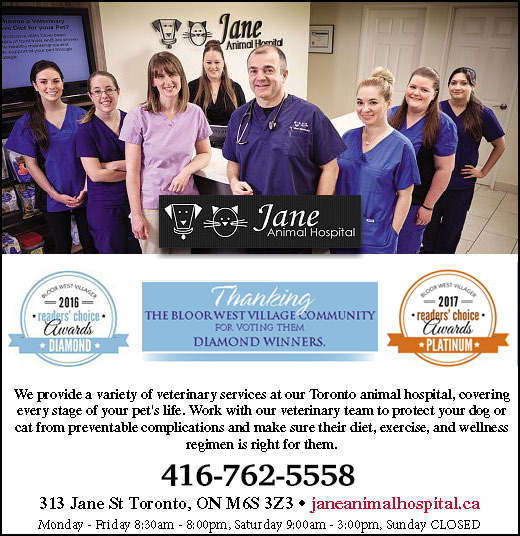 Welcome to Jane Animal Hospital in Toronto! New Clients & Walk-ins Welcome! Your pet is sick today? We will fit you in. Although it is always best to book your pet's next appointment to avoid wait times, please know: if you are ever in need, we are here for you and accept walk-ins until closing time. We provide a variety of veterinary services at our Toronto animal hospital, covering every stage of your pet's life. Work with our veterinary team to protect your dog or cat from preventable complications and make sure their diet, exercise, and wellness regimen is right for them. Pet Exams, Vaccinations & Wellness – Arm your pet with comprehensive preventative care, and avoid some of the painful and expensive conditions that may develop without wellness checkups. Our preventative exams start at birth, with new patient physicals for all puppies and kittens. These examinations may include any scheduled vaccinations or booster shots, lab tests, vital sign measurements, and exterior inspections to catch any problems in their earliest stages. We also offer a lifetime of customized wellness care for each and every patient, specializing your pet's health screenings to accommodate their current needs and risks. Pet Diagnostics – We do our best to catch early warning signs and treat recurring conditions before they get worse. Our diagnostic services include screenings, blood tests, physical exams, ultra sounds and digital X-rays services that allow us to identify and diagnose your pet's particular illness, injury, or health condition. We act quickly and thoroughly to pinpoint your pet's problem, so that we can track down the solution they need as soon as possible. We also have access to a board certified endoscopy specialist, radiologist and cardiologist. Surgery – Our surgical services include preventative spay and neuter procedures, orthopedic operations, eye surgery and tumor/foreign body removal to emergency, orthopedic and internal procedures and soft tissue surgery. Our animal hospital in Bloor West Village is equipped with state-of-the-art surgical technology, and our veterinary team works hard to keep your pets as safe and comfortable as possible as we use innovative procedures to correct injuries, treat complications, restore mobility, remove growths, and more. Pet Dental Care – Our pet dentistry team is committed to preventing dental diseases and the serious complications that they cause, such as heart and kidney disease. Schedule regular pet dental exams to keep your pet's teeth clean and allow us to keep track of any injuries, buildup, malformations, or early signs of disease. Pet Boarding–We will take care of your pets while you're out of town. Our Toronto vet clinic is fully equipped with a comfortable boarding facility, and our pet care staff gives every guest the hospitality they deserve. Microchipping - If your pet gets lost and is taken to an animal shelter or veterinarian, they will scan the microchip to read its unique dog or cat ID code. Dog and cat microchipping is a simple procedure. A veterinarian simply injects a microchip for pets, about the size of a grain of rice (12mm), beneath the surface of your pet's skin between the shoulder blades. The process is similar to a routine shot, takes only a few seconds, and your pet will not react any more than he would to a vaccination. No anesthetic is required. Pet Licensing - Jane Animal Hospital is happy to help you out with licensing your pet with the City of Toronto! Come to our hospital and purchase or renew your pet license. We will take your information and payment and your new tag will be sent to you in the mail! Nutritional & Behavioural Consultations - The role of diet and nutrition is often overlooked in pets, each animal is unique, and there is no "one size fits all" diet that can accommodate the broad and varied requirements of our beloved companions. Diets will differ based on the life stage of the animal (development, adult, senior), dietary restrictions, medical conditions, and financial considerations. Jane Animal Hospital is a Toronto vet clinic with heart. We know you rely on your pet's vet to keep your family complete, and we will do everything we can to give you many years of happiness and health. Call us today at 416-762-5558 to schedule one of our veterinary services for your Toronto pet.